The crinkled and curved petals of the Green Wave Parrot Tulip are truly elegant. 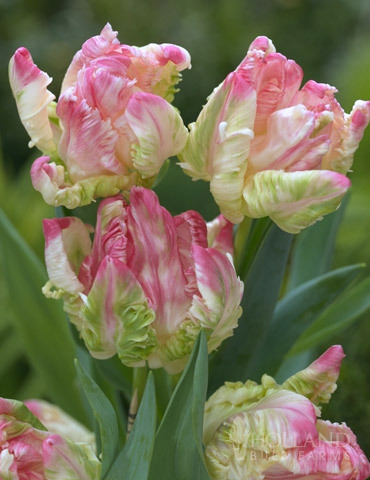 The shimmering watercolors of pink and cream, with an occasional splash of green make this tulip a must-have. The blooms almost look irredescent, the colors resembling those of a rare and perfect pearl. Can be sensitive to cold wet weather, but excellent cut flowers. Represents perfect love & eternal happiness!